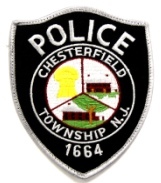 The Chesterfield Township (NJ) Police Department encompasses eleven (11) sworn police officers who are all EMT certified and one civilian employee. Located in Northern Burlington County, the department provides comprehensive 24-hour services to the residents and visitors to its 21.5 square mile borders. The Police Department is made up of a Chief, two Sergeants, eight full-time Patrolmen, one part-time Patrolman and a full-time Secretary. The department provides many services to the members of the township such as patrol, community policing, crime and accident investigations, property, business, and vacation checks, bicycle patrol, and many more. The Police Department prides itself in its community policing and is involved with such organizations as LEAD, Keenagers, and the Scouts. 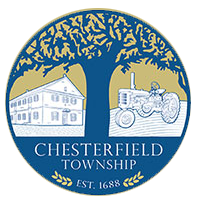 The mission of the Chesterfield Township Police Department is to protect and serve the residents of Chesterfield Township in a courteous, professional and respectful manner and to uphold and maintain the laws of the township and state. The Chesterfield Township Police Department is dedicated to working together with the residents and those who conduct business here to create a safe and secure way of life for everyone that lives, visits or works within its borders.